This is probably one of the most unknown Disney classics. For the time the movie was quite new and revolutionary and it doesn't quite fit in with the other movies Disney made in that period., perhaps that's the reason why it has been forgotten. 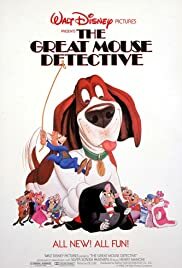 But "The Great Mouse Detective" deserves to be known and seen. The characters are real classics and one of the best to have ever appeared in a Disney movie. 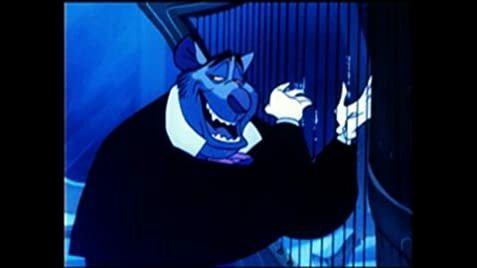 Actually Professor Ratigan (voiced by the legendary Vincent Price) is quite possibly my favorite movie villain of all time. No wonder that it was Vincent Price's favorite role. His style and humor is priceless and it cracks me up every time. But the other characters are also very memorable. I especially like the character of doctor Dawson. The story is good and very pleasant and very mature compared to other Disney's from that period. But of course the idea of making a story about the mouse version of Sherlock Holmes alone is already good enough to make a fun movie about. One of the other things that makes this movie different compared to other Disney's from that period are the songs or better said the lack of it. The movie features only one song (3 if you count the bar song and the goodbye, so soon song.). But it's not a miss. The surprising magnificent musical score by famous composer Henry Mancini make up for this loss. The movie has a very spectacular final on and in the famous Big Ben. It's by far my favorite Disney movie ending. Certainly a fun movie to watch over and over again. P.S. : If you're Dutch speaking, I highly recommend that you watch this movie Dutch spoken. Believe it or not it's even better and more fun then the English version! Believe me, just give it a shot.